« !PICKLES!-FEST HAS HIT THE LOCAL NEWS! 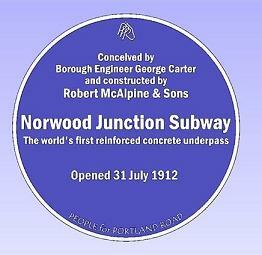 This summer marks the centenary of the opening of the pedestrian subway under Norwood Junction Station. This subway was innovative in that it was an early, if not the first, use of reinforced concrete as a tunnel lining. The deep-bored London tube tunnels from the 1890s onwards had all been lined with more expensive cast-iron segments. The centenary will be commemorated on 31 July with the unveiling of a plaque at each end of the subway. A local residents group, People for Portland Road, are funding the expense. The circular-section 84m/97½ yards long tunnel was driven, apparently through London Clay, below the station buildings and all seven platforms and six currently operating through lines without interrupting train services, under powers conferred by a London, Brighton & South Coast Railway Act of 1911 1. With its west end in Station Road, and its east end communicating with public footpaths to Carmichael Road and Clifford Road, the subway completely bypasses the station’s own internal subway linking its several platforms and front and rear entrances. Norwood Junction Station opened on its present site in 1859. Reports in local newspaper Norwood News 2 at the beginning of the 20th century indicate the presence of a subway from c1862. As the population of South Norwood grew, there were increasingly frequent times when the subway became congested causing inconvenience. Letters in Norwood News 2 in the late 1890s complained that it often required five minutes to accommodate the departure of a train load of passengers. In addition to this the deleterious condition of the tunnel gave grave cause for concern; it being narrow, candle-lit and permanently damp on the west side due to a leaking adjacent sewer pipe. In 1901 prominent members of the community led by the local vicar, Rev Bickersteth Ottley, petitioned the London, Brighton & South Coast Railway Company seeking improvements to the subway. The company directors acceded to the request, but intimated that their renovated subway would be private, ie for railway ticket holders only. It was known that this would reduce their costs in paying ticket collectors to stand on platforms 3 and 4, 5 and 6 as well as at both station exits. On 1 July 1903 the London, Brighton & South Coast Railway Company closed their subway to the public. They undertook widening and renovation of the subway, and improved access between station platforms. However, to the incredulity of the community prohibited its use to the general public. South Norwood had been effectively bisected. A Croydon Alderman pointed out that the roads on the east side of the line had been laid out on the assumption that the subway was a public means of access to and from the High Street. Indeed the site of the London, Brighton & South Coast Railway Company subway was precisely located where a small bridge had traversed the earlier London to Croydon canal, certainly from 1811. There then followed a decade of considerable local agitation and deft political manoeuvring. In 1910 the Streets Improvement Committee recommended to Croydon County Borough Council an outlay of £6,000 (incidentally the cost of the renovated London, Brighton & South Coast Railway Company station subway) for a new tunnel to be constructed. The construction was able to begin once powers conferred by a London, Brighton & South Coast Railway Act of 1911 had been granted. This was necessary because the subway involved excavating on the highway on the west side of Norwood Junction Station, in Station Road. The cost of the Act was circumvented by the London, Brighton & South Coast Railway Company ‘bolting’ it onto another that they put before Parliament. George Fearnley Carter (c1879-1962), the Borough Engineer, and Councillor W Robarts began to seek suitable contractors. They learned that the construction firm Messrs. McAlpine & Sons were building a water conduit in a ‘peculiar method’ using reinforced concrete. Carter conceived it might be possible to construct a subway using this new technology and so designed the subway using this approach. In 1911 McAlpine & Sons were already a well established company, with 20 major contracts in hand. Among these were the Cuffley to Hertford Railway for the Great Northern Railway (costing £300,000 — £400,000), Methil Dock (about £700,000), Corby widening (which was to be six miles long), the Hemsworth widening (five miles long) for the Great Northern Railway. They were opening out the Darnoll Tunnel for the Great Central Railway Company, which involved the removal of over 300,000 cubic yards of rock. The sewers in tunnel at Southend-on-Sea (ten miles long) were also in progress. McAlpine & Sons had already carried out many important tunnel contracts, where, as was the usual custom, the tunnels were lined with cast iron or brick. However, where brick was used, tunnelling was expensive because the excavation had to be temporarily held up with timber and this required extra excavation. In many cases the excavations formed a square hole even though the tunnel itself would be round. A means of overcoming this construction difficulty early in the 20th century employed the use of cast iron. The lining of a tunnel being put in, in short lengths and the excavations cut to the exact shape of the tunnel. However, the considerable cost of cast iron meant that this method was expensive and likely to be over the budget allocated by Croydon Council. McAlpine & Sons had at the time been experimenting with a method of combining the convenience of cast iron with the cheapness of concrete, and the strength of reinforced concrete. The principle used in the Norwood Junction Subway is that it is a tube composed of concrete segments 7in/178 mm thick, 1ft/305mm wide and about 2ft 6in/762 mm long, reinforced with steel bands 1ft/305mm apart. These segments were fixed as the boring proceeded. The ground was excavated and, as each ring of sections 1ft forward was completed, a steel bar 1⅛in/28.6mm in diameter was embedded at the joint clasping the segments. A strengthening saddle was placed over the tube, under the running roads. As the segments were completed cement under pressure was forced into the outside of the sections so as to fill any gaps or inequalities. By these means there was no interference with the metals or the running of the railway. Consequently there was no inconvenience to the ordinary running of the railway even though the top of the tube is just 2ft 6in/762mm under the rails. Usually the building of a subway would seriously impede the use of the railway thereby increasing the costs of labour, and the guarding against risks. The cost of the concrete segments and steel reinforcing rings was considerably less than had cast iron or steel tubing been used. Given these commendable points, McAlpine & Sons then expected to hold the market in this method of production; correctly as it turned out. The interior of the subway was lined with glazed tiles. These were green for two feet up from the floor, then white over the rest being rendered with Keene’s cement to prevent tiles becoming loose as a result of vibration from overhead trains. 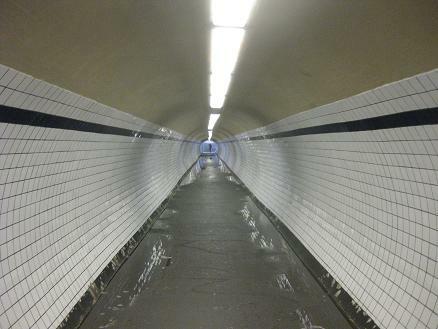 The tube or subway is 300ft/91.4m in length; and 9ft 3in/2.8m at elbow height wide, this width being considered suitable for four people to walk along side by side. It was lit with electricity from the beginning. The interior resembles the London Underground tubes. Initially the builders had to first show the railway authorities that a tube so close to the surface would not put the rails out of alignment given the amount of earth around it. McAlpine and Sons satisfactorily demonstrated that there was no such risk and construction was able to proceed. Another valuable feature is that although only 2ft 6in/762mm below the rails there is no appreciable noise in the subway from trains passing overhead. This is because of the insulating properties of concrete. This is markedly different from noise experienced in the railway subway between platforms. The subway is approached by a gradient (decline) on either side. On the Station Road side the slope is about 1 in 8. Here the opening has a stone coping and is surrounded by an iron fence 5ft/1.5m high. On the Clifford Road side, McAlpine built a boundary wall with large concrete blocks with rock facing. The effect was said to ‘combine the strength and appearance of an old Roman or city wall’. It is interesting to note that access to platforms 3 to 6 of Norwood Junction Station using the adjacent railway company subway is still by stairs. At the time the subway was said to be an example to lead the engineering world in similar undertakings in the future. Work began from both sides of the railway in February 1912 and was carried out under the supervision of the Borough Engineer. Completed that summer, it was formally opened on 31 July with considerable ceremony. Given disturbances to sewer, water, gas and electricity mains the Norwood Junction Subway cost c. £4,700, a saving of £1,300. In 2011 local initiative, with Croydon Council backing, saw the commissioning of colourful murals depicting local scenes on both sides and from end to end of the subway – The Long Way Home by Liane Lang (www.lianelang.com). This added to an earlier mosaic mural alongside the pavement under the nearby Portland Road railway overbridge. South Norwood has an industrial and transport heritage of which it can justly be proud. The inventor, industrialist and philanthropist William Ford Robinson Stanley’s former factory (GLIAS Newsletters 160 and 247, p8) is, in part, still standing near the station; and his Stanley Halls and adjoining Stanley Technical Trade Schools (the latter now renamed Harris Academy South Norwood) remain in use. Hendersons had film laboratories (GLIAS Newsletter 239, p9), and CT Brock made fireworks nearby for some years, and there were several flourishing brickfields (GLIAS Newsletter 213, p11). South Norwood Lake, Croydon’s largest expanse of open water, is the most substantial remaining evidence for the former Croydon Canal (GLIAS Newsletter 213, p10, and 195, p6), which passed through South Norwood until taken over by the London & Croydon Railway which opened in 1839 (GLIAS Newsletter 236, pp7-8). And that railway company operated, for a few years, one of only four ‘atmospheric’ railways built anywhere in the world (the trains were pushed along by air pressure).